One of the biggest challenges for the vinyl industry has been available dark color selection for vinyl profiles. The introduction of color and wood grain laminates hit the mark for VEKA and provided the right solution for its customers. 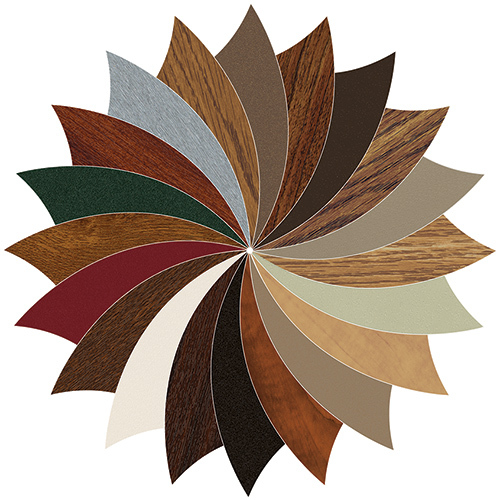 Colors like bronze, hunter green, garnet, and brown have been the darkest color solutions capable of meeting or exceeding ASTM requirements, until now. VEKA is happy to report that it has improved on its previous color technology and is introducing a true black option. Since its launch in 2012, VEKA's laminates for PVC window and door systems have grown beyond the company's expectations. Although the lineup hasn’t changed much over the past five years with the exception of a few color changes, the selection of foils has proven to significantly contribute to our customer’s growth in colored vinyl window sales. Laminate sales have increased by a mark of over 8% in each of the past three years, not a surprising trend considering the increased demand for color options in both residential and commercial applications. The realistic surfaces fulfill the AAMA 307 and 303 test requirements for superior performing laminated profiles. Both third-party inspection agencies and internal testing indicate that laminates are suitable for some of the harshest climates and are guaranteed for a period of 10 years. The laminate surface resists abrasion, mortar, detergents, and chemicals, in addition to demonstrating superior performance and low heat build-up in areas of high-incident solar radiation, such as the desert South West. Response for Black Onyx laminate at Glassbuild America was astounding. In fact, it has been selected by the readership of DWM Magazine to be the most significant coating/film product/laminate of 2016. We fully expect Black Onyx to be our best seller by the end of 2017 so now is the time to enhance your product portfolio with Black Onyx laminate by VEKA. If you would like more information on expanding your product portfolio with laminates, VEKA fabricators are asked to contact their regional sales manager for more information. Read more news from VEKA Inc.